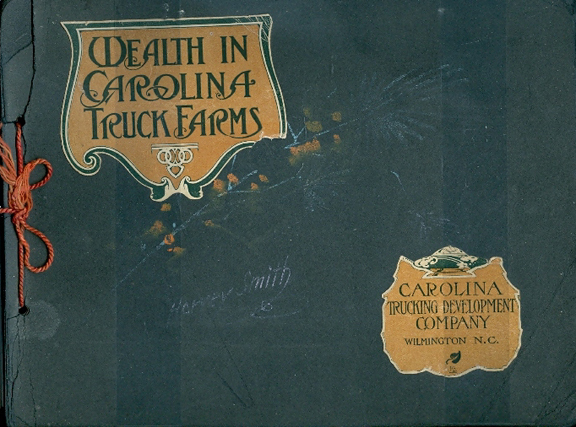 Description: This black, cardstock photo album measures approximately 7 by 9 inches and contains 12 black and white photographs relating to the Carolina Truck Farms. The cardstock pages are tied together with a red cord. History: This album was purchased by the Museum in 2000. The-black-and-white photographs depict the members of the Carolina Trucking Development Company in various locations throughout the state, including Wrightsville Beach, Look Out Mountain, Artesia, and Chadbourn. The Carolina Trucking Development Company was founded in 1905 by Hugh MacRae (1865-1951). Mr. MacRae graduated from M.I.T. with a degree in Mineral Engineering. He was a real estate developer, president of a cotton mill, railroad director, and owner of Linville Improvement Company, Carolina Trucking Development Company, and Tide Water Power & Light Company. MacRae owned approximately 250,000 acres of land in various counties throughout North Carolina. These lands were divided into 10-acre farms and sold to European immigrants who MacRae hoped would bring their intensive farming methods to the state. Between 1905 and 1913, the company began six colonies, Marathon (Greek), Castle Hayne (Dutch, Polish), St. Helena (Italian), Artesia (Dutch, Polish), New Berlin (German) and Van Eeden or Eden (Dutch). New Berlin was later renamed Pershing in honor of General John Joseph Pershing (1860-1948) and then Delco after the Delco Light Plant Company due to anti-German sentiments during the First World War. In 1939, the Van Eeden Colony became a temporary settlement for Jews fleeing Germany under the New School for Social Research headed by Dr. Alvin Johnson. Castle Hayne was the most successful of the six colonies.